Cypress came to Out of Africa Wildlife Park with her sister Aspen at just 6 months of age from a taxidermist in North Carolina. 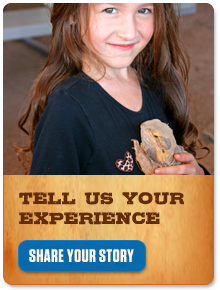 Kept in a 10’ x 10’ cage with concrete floors until rescued, she now enjoys the space and stimulation she needs, including swimming and playing in the Wonders of Wildlife show on most Saturdays. While her sister was more curious and loving, Cypress acts more like a typical grizzly bear. With a 2-acre habitat to romp around in, there’s plenty of room to satisfy the playful personality of Cypress. With a yearlong, steady diet along with a mild and bearable winter (pun intended), Cypress does not hibernate. However, she does become a bit lethargic during the winter months. The grizzly bear is known by many names: the silvertip bear, the grizzly, or the North American brown bear. It is a subspecies of the brown bear that generally lives in the uplands of Western North America. The species is found in Alaska, south through much of Western Canada, and into portions of the Northwestern United States including Idaho, Montana, Washington, and Wyoming, extending as far south as Yellowstone and Grand Teton National Parks, but is most commonly found in Canada. Most adult female grizzlies weigh 290 to 650 pounds, while adult males weigh on average 350 to 890 pounds.The average total length in this subspecies is 6 ½ feet with an average shoulder height of 3 ½ ft and hind-foot length of 11 inches. Surprisingly, newborn bears may weigh less than one pound. Although variable from blond to nearly black, grizzly bear fur is typically brown in color with white tips. A pronounced hump appears on their shoulders; the hump is a good way to distinguish a black bear from a grizzly bear, as black bears do not have this hump. The gestation period of a grizzly is 6 to 8 months, including a 5-month delayed implantation period. (Once mated with a male in the summer, the female delays embryo implantation until hibernation). The number of cubs born can be between 1 and 4, although 2 is more typical. The mother cares for the cubs for up to 2 years, during which time she will not mate. Sexual maturity is reached between 3 and 5 years. Once the young leave or are killed, females may not produce another litter for 3 or more years, depending on environmental conditions. Because of these factors grizzly bears have one of the lowest reproductive rates of all terrestrial mammals in North America. These giants tend to be solitary animals—with the exception of females and their cubs—but at times they do congregate. Dramatic gatherings of grizzly bears can be seen at prime Alaskan fishing spots when the salmon run upstream for summer spawning. In this season, dozens of bears may gather to feast on the fish, craving fats that will sustain them through the long winter ahead. Despite their impressive size, grizzlies are quite fast and have been clocked at 30 miles an hour. They can be dangerous to humans, particularly if surprised or if humans come between a mother and her cubs. Although grizzlies are of the order Carnivora and have the digestive system of carnivores, they are normally omnivores, since their diet consists of both plants and animals. They have been known to prey on large mammals when available, such as moose and deer. 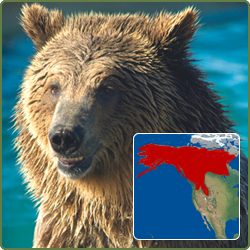 In coastal areas grizzly bears feed on salmon, trout, and bass. This protein-rich diet helps to produce larger Canadian or Alaskan grizzlies than those living in the interior. In Yellowstone National Park in the United States, the grizzly bear’s diet consists mostly of white-bark pine nuts, tubers, grasses, various rodents, army cutworm moths, and scavenged carcasses. None of these, however, match the fat content of the salmon available in Alaska and British Columbia. In preparation for winter, bears can gain as much as 400 pounds. The word grizzly in its name refers to “grizzled” or grey hairs in its fur. The grizzly bear appears on the flag of California, though they are extinct in the state, the last one having been shot in 1922. In some areas where food is plentiful year round, grizzly bears skip hibernation altogether, although they tend to be more lethargic in nature. During hibernation, a bear’s heart rate slows from up to 70 beats per minute to only 10 beats per minute. Their metabolism slows, and they do not urinate or defecate all winter! This “winter sleep” allows the bears to stay alive for a long period of time when there is little or no food available to them. Bears in warmer climates spend less of their time curled up in their dens than those in an area with a longer winter. The grizzly bear has several relationships with its ecosystem. After consuming fruit-bearing plants, the seeds are dispersed and excreted in a germinated condition, deposited with nutrients in feces. This makes grizzly bears important seed distributors in their habitats. While foraging for tree roots, plant bulbs, or ground squirrels, bears stir up the soil. This process not only helps grizzlies access their food but also increases species richness in alpine ecosystems. The grizzly bear is listed as threatened in the contiguous United States and endangered in parts of Canada.